Tesla's Model X SUV is so strong it earned a Guinness World Record for towing. Tesla released a video on Tuesday that shows one of its electric SUVs towing a 287,000-pound Boeing 787-9 Dreamliner nearly 1,000 feet on a taxiway at the Melbourne Airport in Australia. 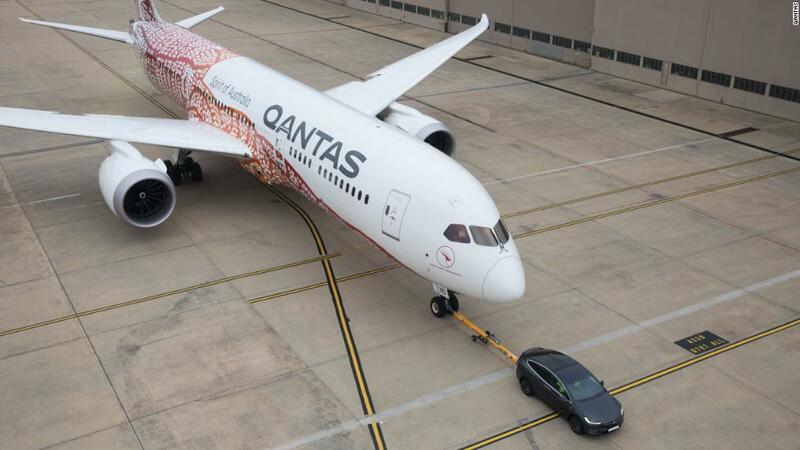 The plane is part of Qantas Airways' fleet and the effort set a new Guinness World Record for being the "heaviest tow by an electric production passenger vehicle." This is a massive feat for the SUV, which can typically tow about 5,500 pounds, according to a press release. The 787 had a small amount of fuel in its tank at the time, and wasn't carrying any passengers or cargo. Qantas, which uses electric aircraft tugs to pull planes much shorter distances at two airports in Australia, said the publicity stunt sought to bring attention to its sustainability efforts. The airline was recently criticized by the International Council on Clean Transportation for its record on pollution. The group found that Qantas pollutes more than its regional competitors on trans-Pacific flights. Qantas said it is committed to improving sustainable efforts by retiring its fuel-guzzling Boeing 747s and replacing them with 787s, which are more fuel efficient and fly longer distances. Qantas also said it is experimenting with energy efficient fuels. The airplane model is relatively new to Qantas. The 787-9 offers the first nonstop airline service between Australia and Europe -- the trip between Perth and London is 17 hours long. This isn't the first time Qantas and Tesla have created a video that's gone viral. In 2016, a Qantas Boeing 737-800 aircraft raced a Tesla Model S P90D on an airport runway. The race was tight: Tesla reached speeds of 155 miles mph and the plane neared 160 mph or 140 knots, before taking off and eventually winning the race. Correction: A previous version of this story misidentified Qantas Airways.